In the neuroscientific equivalence of telepathic instant messaging, Charles Grau from Starlab Barcelona, and others, had individuals from France communicate with individuals in India… telepathically. Yes you heard that right! With a human subject in France, and the other in India, they successfully transmitted the words “hola” and “ciao” in computer assisted brain-to-brain thought. 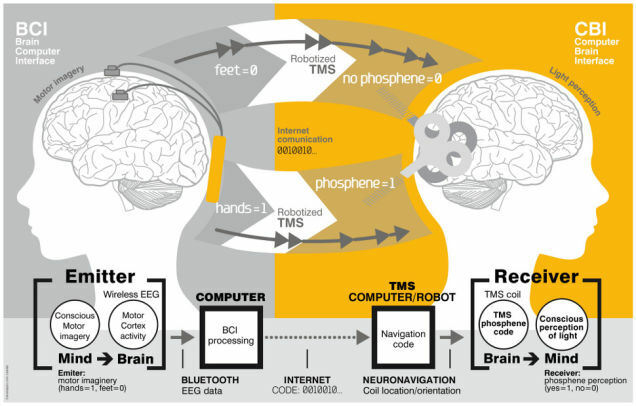 How it worked, the team fitted an individual with an electroencephalograms (EEG), which facilitates communication between a human brain and a computer, and another individual with a robot-assisted image-guided transcranial magnetic stimulation (TMS), which is useful for mapping the motor cortex. They used the electrodes attached to one person’s scalp to record the electrical currents in the brain and interpret those signals and translate them into an output which they sent to the other individual and transmitted the message into their brain. Individual A in France would think “hola”. That thought was mapped by the TMS and translated into a text output “hola”. This was then converted into binary and sent via the internet to individual B in India. Using the EEG, the researchers’ transmitted “hola” to the brain via noninvasive brain stimulation known as phosphenes — flashes of light in the peripheral vision. Though a crude form of brain-to-brain communication, it offers us a framework for the way forward regarding telepathic communication, and is definitely a first in the realm of non-invasive direct communication between human minds. You can see the full study in the journal PLoS ONE.